A perfect day for having my hands in hot soapy water! I recently discovered cobweb felt. I have visions of using this ultra thin, airy, almost translucent material as an overlay. The patterns of holes that form are deliciously organic. 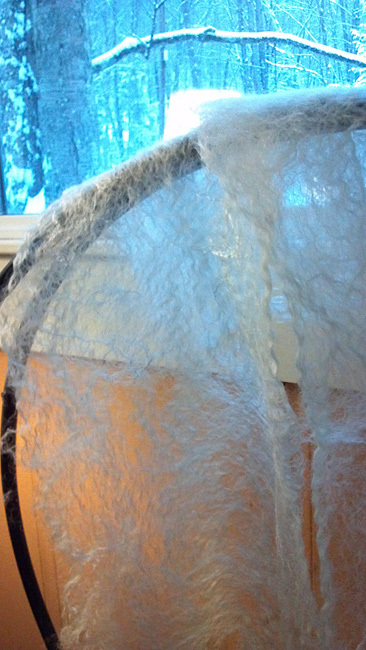 After watching a clear step by step video by Greenwood Fiberworks, it was quite easy. I made some adaptations to the directions born out of laziness. For instance, the lay out for this felt is so thin, I stacked a second layout on top (over plastic) and rolled them all together. Worked fine. I used Wensleydale roving bought at New England Felting Supply and embellished with lustrous Bombyx Silk. 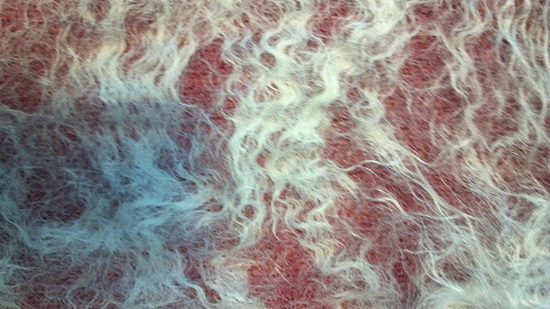 The fibers of Wensleydale are straight but after felting they form intriguing curls and waves. And it does this transformation after only 100 rolls! My kind of felt! We’ll see how it behaves in the dye pot! This entry was posted on February 18, 2014 at 7:36 pm and is filed under felting, Process. You can follow any responses to this entry through the RSS 2.0 feed. You can leave a response, or trackback from your own site.